Please select dates and click "Search" button to find available room in Bicycle Hotel Amsterdam. As the name already implies, this is a bicycle hotel. Besides lodging, the hotel provides bike rental, parking for bicycles, bike maps,(paid-)car parking and information about the city, restaurants, markets and events. The hotel is located in a typical old-Amsterdam neighbourhood, which is well known under the name 'De Pijp'. Museums, a market, entertainment and the RAI congress centre are all within a stones throw. 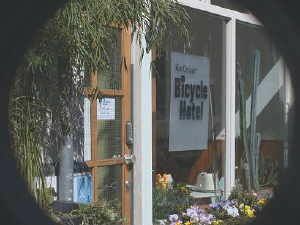 Van Ostade Bicycle Hotel is a simple but clean hotel with a friendly staff. Take tram 25 and get out at stop 'van de Helststraat,' walk in the street next to "Peters Letters" near the tram stop and take the first street to the right.